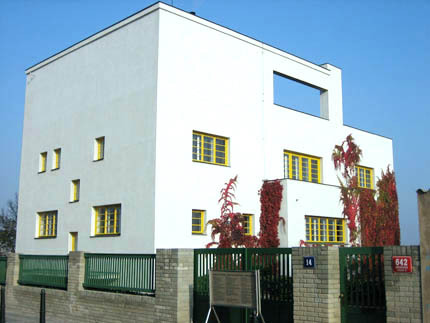 Completed in the same year as Le Corbusier’s Villa Savoye in Paris and Mies van der Rohe’s Villa Tugendhat in Brno, the Villa Müller is Loos’s defining modern house in an era when rich, progressive industrialists were the source of modernist commissions. In Loos’s case the client owned a building company pioneering the use of reinforced concrete, so the house was a particularly relevant showcase. 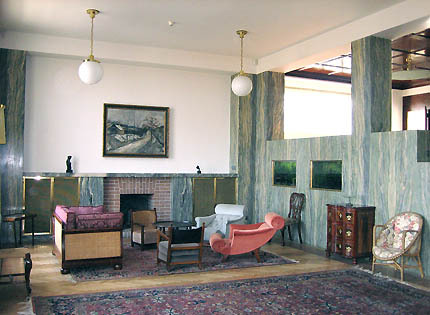 While Frank Lloyd Wright was perfecting the seamlessness of the transition from inside to outside, Loos was deliberately keeping the public outside and the private inside of his houses as separate as possible. "The building should be dumb outside and only reveal wealth inside." 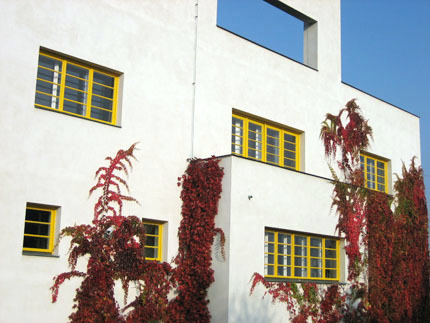 Outside, the Villa Müller is distinguished by its cubic shape, with flat roof and terraces, its irregular windows and its clean, white façade. Inside, the Villa Müller is at once more traditional and more original. The materials are warm, rich and comforting, and the furniture a deliberately eclectic mix of traditional styles. The client is not required to conform to some all-consuming modern lifestyle. 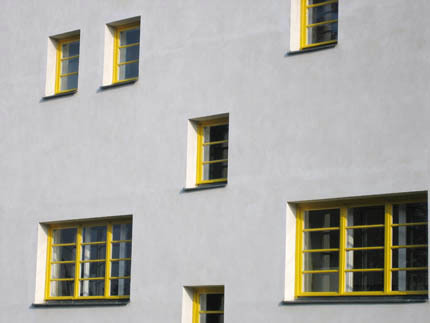 On the other hand the spatial planning of the building is where Loos was most innovative. My architecture is not conceived by drawings, but by spaces. I do not draw plans, facades or sections... For me, the ground floor, first floor do not exist... There are only interconnected continual spaces, rooms, halls, terraces... Each space needs a different height... These spaces are connected so that ascent and descent are not only unnoticeable, but at the same time functional. 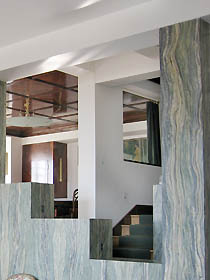 This spatial design, finished with luxurious and vibrant marbles, woods and silks, “combined innovative architectural design with the cultural conception that the upper middle class had of itself” (August Sarnitz). Loos uses the different levels of the Raumplan to create a careful “architectural promenade” from outside to inside. 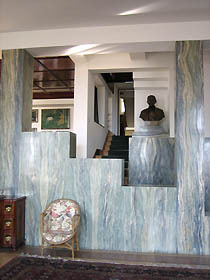 The first entrance way is low, with strong but dark colors such as deep green/blue tiles. This opens onto a cloakroom area that is generous in plan, brighter with white walls and a big window, but still low. At the far end a short, modest staircase takes the visitor round a right-angle bend, emerging dramatically between marble pillars into the double-height, open-plan sitting room. The promenade continues past the raised dining room to the upper floors of the house, the Raumplan providing unusual and exciting views into adjacent rooms. 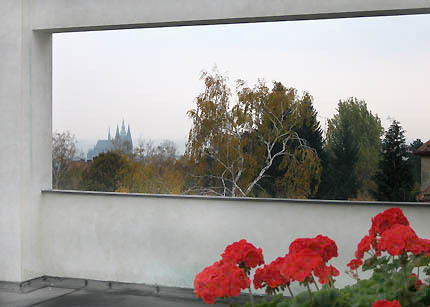 On the top level is a roof terrace, with a “window” in the freestanding end wall to frame the view of Prague cathedral. 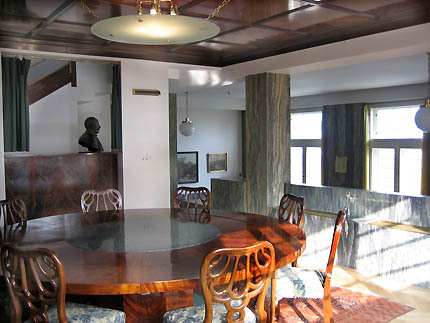 The Villa Müller was comprehensively restored in 2000 and is open to the public, operated as part of the City of Prague Museum. It is open only on certain days of the week, and can be visited only on a guided tour (in English or Czech) at pre-defined times. It is therefore essential that you book your visit in advance, which you can do at the Villa Müller’s web site. You can also try calling +420 224 312 012 or email vila.muller@muzeumprahy.cz. The Villa is in the Střešovice area to the northwest of Prague’s city center. To get there, take Tram 18 to the Ořechovka stop. Walk forward to the end of the tram stop and you will see the Villa Müller up the hillside on your left. You can climb a public stepped path just beyond the Villa to reach the front entrance of the building. Further visitor information, history, photographs and directions are at the Villa Müller’s web site.